it has an interesting inspiring quote at the bottom. almost all of them are new to me. and I like the general attitude. 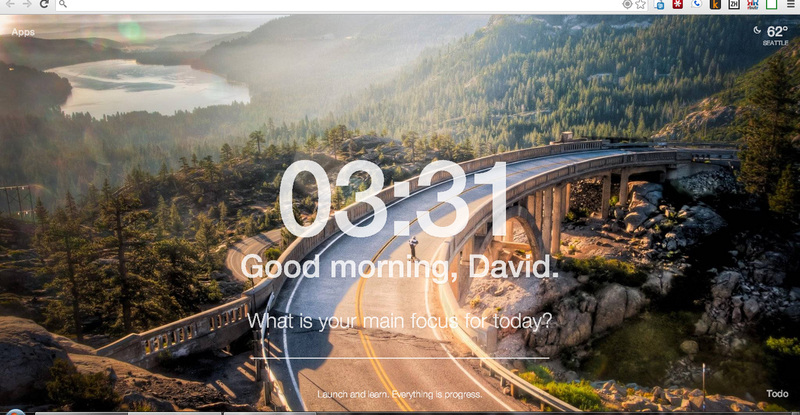 I like the “What is your main focus for today?” prompt. I’m a big fan of focus. But I don’t like that it actually expects me to write something in there. That feels like too much of an “assignment”, which is not what I am looking for from my new tab page. Sometimes this causes me to subconsciously ignore the prompt. I do like the temperature & weather widget in the top right. But I don’t look at it very often. I don’t care for the to-do list in the bottom right corner. Maybe it would be useful, but that’s not the place I’m looking for a to-do list. I prefer handwritten, GTBee (for that extra sting), and the occasional (digital) Sticky Note widget. For a new tab page like this, try the free Momentum extension for Chrome.